The containership where the accident took place arrived in Kobe on 27 March 2012 at 0830 local time. The rescue boat was due to be launched, and it was planned to launch the port side life boat and the rescue boat during the port stay in Kobe. The launching and the sailing with the life boat went without incidents, and the boat was brought back on board and secured. Following the life boat drill, the crew had a toolbox meeting with the crewmembers regarding the rescue boat drill . During this meeting the launching procedure was discussed, and it was decided that the later deceased AB should crew the rescue boat as he had signed on the containership one week prior to the accident and therefore needed routine in operating the rescue boat. According to the vessel’s “Man-Overboard” muster list, the rescue boat should be crewed by the chief officer, the first engineer and one AB. During the exercise only the chief officer and the AB would be crewing the rescue boat. Prior to the drill the chief officer had requested an engineer to operate the rescue boat crane during the drill. Following the toolbox meeting, the rescue boat hook was checked to ensure that it was properly locked and connected to the hoisting arrangement of the rescue boat. The engineer went to the rescue boat crane, and, as per company procedure, tested the crane. As part of the preexercise test, the rescue boat was first lifted from it’s craddle by lifting the crane arm and slewed out over the ship’s side. Then the boat was returned to the craddle in order to test the limit switch. The limit switch was found in good working order, and the rescue boat hook was subsequently cleared from the limit switch by manually grapping the hook and pulling on the wire. As a last test prior to the drill, the boat was again slewed over the side and then lowered to the boat deck and hoisted back up in order to check if it was possible to hoist the boat with the winch. The winch worked as it should and no defects were noticed during these tests. Finally the boat was again lowered to the boat deck from where the embarkation would take place. The boat was prepared for embarkation and the crane was slewed in order for the boat to rest against the ship’s side thereby easing the embarkation. The later deceased AB embarked the rescue boat first. He moved to a standing position in the port side just aft of the centreline handrail (see figures below). At this time nothing out of the ordinary was noticed by any of the crewmembers participating in the exercise. Photo above: The rescue boat/stores crane arrangement with the boat in the stored position. When the AB had positioned himself in the boat, the chief officer embarked. The chief officer took approximately two steps forward and passed forward of the centreline handrail to the port side in the boat when suddenly without warning the boat fell approximately 18 metres to the water. After the boat had hit the water, the chief officer remained conscious but initially confused. He found himself laying in the port side forward in the boat. He quickly became aware of several fractures to his arms and legs. He observed the AB lying further aft in the port side, but the AB showed no signs of life. Due to his own injuries and the fear of any spinal damages, it was not possible to examine further or assist the AB. The remaining crew on board containership reacted immediately to the accident. 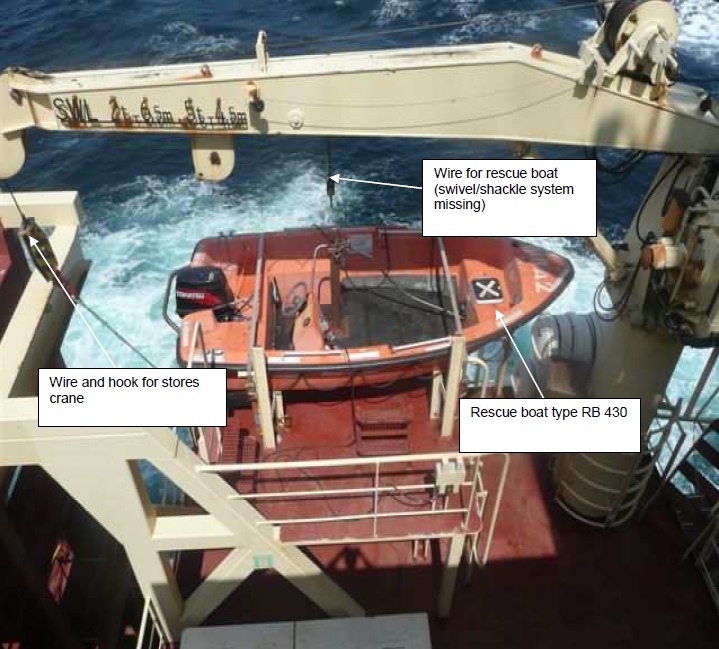 The port side gangway was rigged and from the lower recess of the gangway a crewmember jumped into the water, entered the rescue boat and secured the hook from the stores part of the combined crane in the lifting ring of the rescue boat. The boat with the three persons on board was then hoisted to the boat deck of the containership. It is estimated that it took 15-20 minutes from the boat fell to the water until the boat was landed on the boat deck of the containership. The crew immediately started first aid, and within 5 to 10 minutes from the rescue boat being landed on the boat deck local paramedics arrived at the scene and took over the treatment. At no time did the AB show any signs os life. It was not possible to resuscitate him, and he was declared dead while still on board the containership. The chief officer was brought to a local hospital and received treatment for several fractures in his arms and legs. At the hospital it was established that there were no spinal injuries, no internal injuries and no injuries to the head or neck, and a full recovery is expected. The breakdown was caused by the split pin in the fork end shackle pin having sheared off, thereby allowing the fork end shackle pin to move out of one of the fork ends. The effects to the split pin of having been exposed to the environment may have been contributing to the outer ends of the split pin finally tearing off. When this happened, there was no safety measure against the fork end shackle pin moving out of the fork. When the fork end shackle pin opened, the rescue boat fell to the water. As indicated in the metallurgical analysis the hook arrangement was sound and not affected by corrosion. However, the arrangement showed signs of being exposed to the environment. These effects of exposure may have made it more difficult to observe any damage to the arrangement, including the split pin. The rescue boat arrangement was designed and certified with a swivel having only one fragile lock securing device (3 mm split pin). This indicates that there has not been sufficient focus on the safety critical nature of the equipment considering the intended use of the crane and the crane’s exposure to the environment. The swivel was constructed by using standard parts which were approved and certified, but not specifically for the safety critical purpose of hoisting and lowering manned boats. 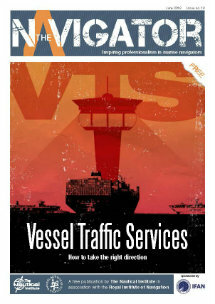 Maintenance work was governed by the SOLAS Maintenance Manual, which was a non-controlled document individually adapted to each individual ship. Furthermore, the maintenance work was carried out by several crewmembers from the engine and deck departments none of whom had, in the relevant documentation governing their work, the specific task of checking the swivel and its components. Consequently, weekly inspections and maintenance of the swivel on each individual ship were to some extent influenced by the individual operation and experience of the crewmembers performing maintenance and checks. 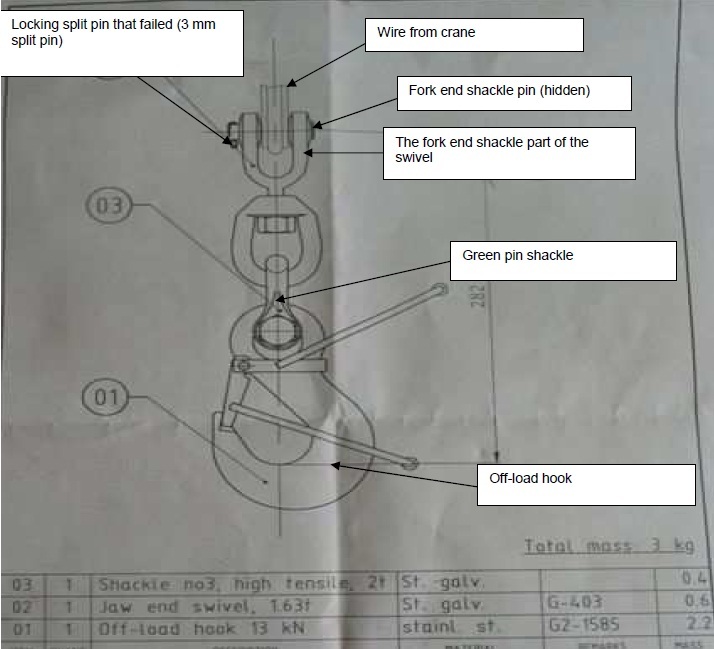 Photo above: Picture of manufacturer’s drawing of the hook arrangement. Photo above to the left: The hook arrangement following the accident. 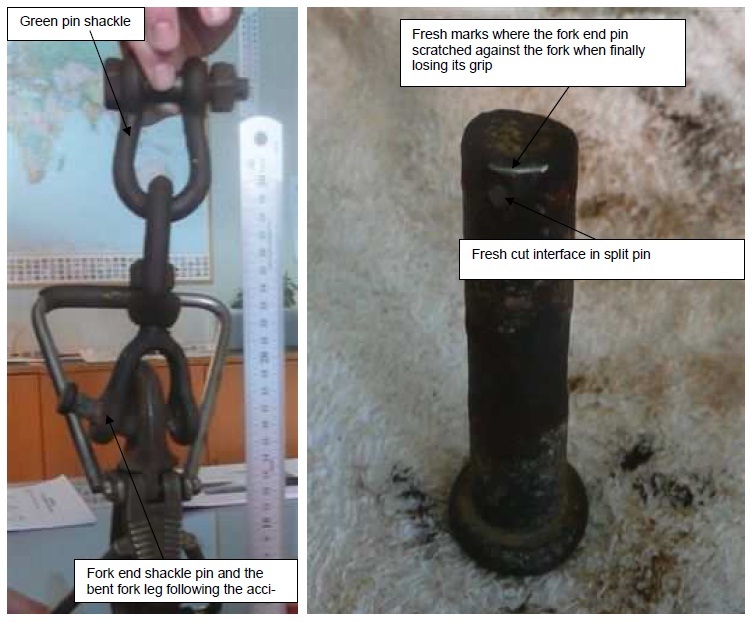 Photo above to the right: The fork end shackle pin with marks after split pin and scrape marks from losing grip and contact with the fork end. The operator ordered all its vessels to remove the jaw end swivel in the rescue boat arrangement where possible, i.e. where a non-twisting wire is used on the drum and the swivel therefore is not needed. During exercises with rescue boats, the boats should be lowered and hoisted without crewmembers. 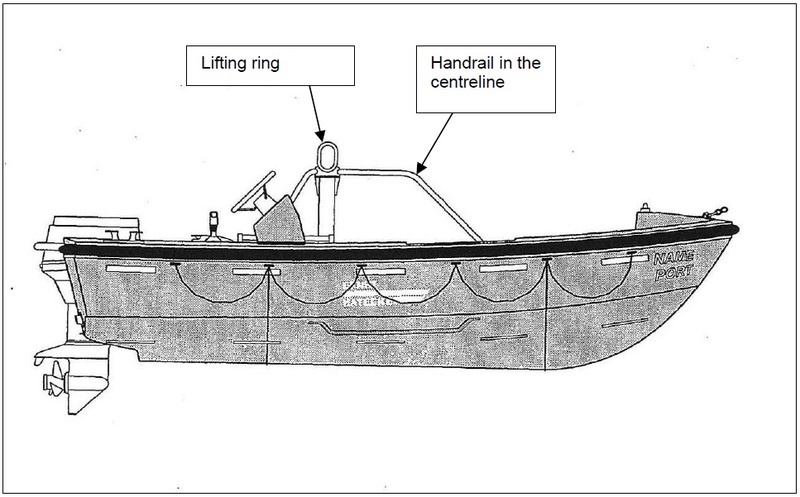 Rescue boat crews should enter the rescue boat via the lowered gangway. One type of hook to be used throughout the fleet, where possible, in order to increase uniformity as well as simplicity for the on-board crews. Use of external inspections of live-saving lifting appliances. Hook fails, seaman dies. Safety first?